Yesterday, when I was describing the quilting I did for the Family and Friends mini quilt, I described it as graffiti quilting. Renee @Quilts of a Feather and, separately, Jenn @A Quarter Inch from the Edge and I had back and forth email conversations about what delineates free motion quilting from graffiti quilting. Make no mistake about it, Karlee Porter coined the term “graffiti quilting” and has a very distinctive style. We need a word that is means lots of different designs used with intention…or something like that. Dendriform: having the shape or form of a tree. Dendrifom makes me think of branching, evolving, growing, organic… I am crushing heavily on the idea of calling free motion quilting that intentionally and mindfully incorporates lots of different designs “Dendrifom Quilting”. I really look forward to hearing your thoughts; I just played around with words and if these aren’t right, maybe it will spark an even better, more awesome idea. Flow: a mental state of moderate enjoyable challenge, of being in the zone, but not frustrated with the challenge. A state of smooth progress. I don’t know if that really describes how I feel when I am doing this kind of quilting… yet, but it is a cool idea! I also have the pleasure of sharing my first mini mini quilt finish for a Patron. Cheryl @Meadow Mist Designs is such a wonderful friend and supporter. When I pinged her with my Patreon support idea, she helped me refine it and was the first to sign up by placing a mini mini quilt order through my Etsy store. 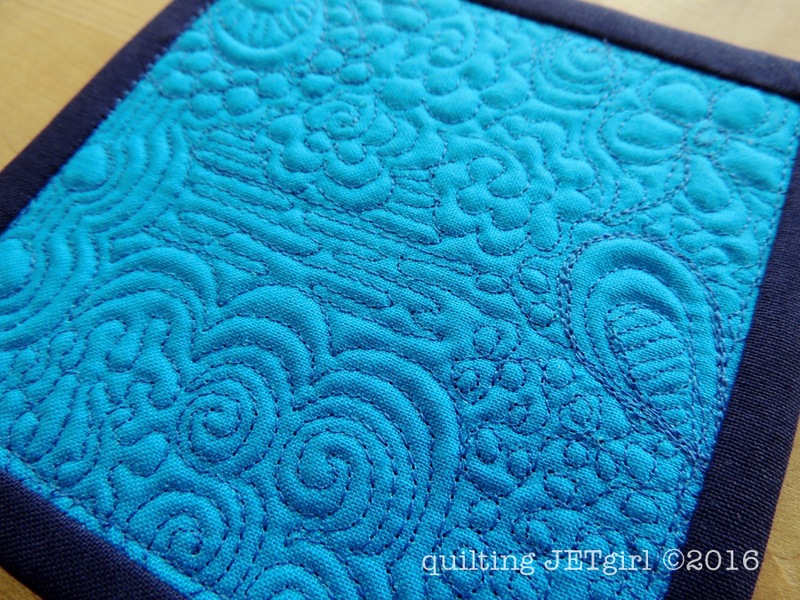 Cheryl said that her favorite color is blue and that she loves my free motion quilting. So last weekend I sat down to quilt up something special for her. 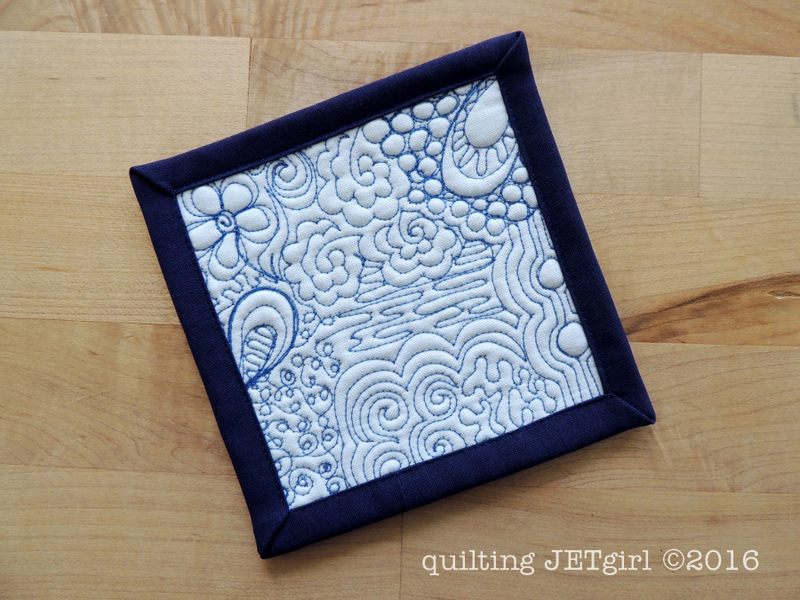 The mini mini finished at 4.5-inches square, and I had a lot of fun playing with the quilting. I used 50wt Aurifil 2735 (medium blue) for the bobbin and 50wt Aurifil 2784 (dark navy) for the top and to stitch the binding down. The mini quilt was made using solids in my scrap bin. The top is Kona White, the back is Kona Turquoise, and the binding is Kona Nautical. Cheryl received the mini mini quilt in the mail yesterday and I am thrilled that she is happy with it! I am crushing hard on this awesome quilting community and looking forward to the discussion in the comments about this FMQing naming idea. I love the word “dendriform”. I have been thinking about definitions/names in other contexts: on one level it should be okay just to do what we do and not worry about what to call it, but names help us describe our work, the intention behind it, our philosophy and to locate ourselves within the enormous quilting world. I hope you settle on something that feels right for you. Word choice is hard and my initial thought is to move on win the attitude that we quilters can just do what we do. Why is everyone worried about labels? But labels are important because the world is a better place when we communicate clearly. I prefer the term dendriform or organic…storyboard and composition sound too formal and stiff for this type of design. Really interesting! I tend to use ‘organic’ to describe a lot of my quilting. It seems to cover many different forms. Composite quilting. (Something made up of different parts or elements) I agree with Kaja, having a name or word to describe something is helpful. Love your little mini mini for Cheryl! I may have to give something like this a try! I have not thought about naming the collection as a whole, but rather like to hearing what other people call the different designs within the grouping. Even though these minimini’s are small, I think labeling or signing the back is a good idea. That way you can look back and see who made the quilt and when. Hmmm… dendriform (while easily Google-able) isn’t a term that most people would be familiar with. I still don’t really see why it can’t be called graffiti quilting, apart from the fact that someone has coined the term for their own style (and published about it). It looks very like a much tagged section of overpass – multiple shapes crushing into each other, some distinct, some blending. If you were drawing with a pen, this would be a Zentangle. Why not a quiltangle? Flow Quilting (a mental state of moderate enjoyable challenge, of being in the zone, but not frustrated with the challenge. A state of smooth progress)–this one is probably our favorite right now. In response to one of the comments about why we need a label: having a descriptive word for a style of quilting means we can claim something as our own. We can use a hashtag or blog label to group similar images/posts, the style becomes searchable on google. Words hold a lot of power, so using the right words to describe what we are creating is important. The term “graffiti quilting” is used by an up and coming quilter, Karlee Porter, and her style is quite different from what Yvonne or I do. One reason I do not like using Karlee’s term is because the word “graffiti” has a negative connotation to it. I don’t like using the term “doodle quilting” because it implies I’m mindless scribbling on fabric, when that is almost the opposite of my intention! So I want a word that means I’m quilting something without a lot of structure or plan, something fun and free form, yet with intention and grace and beauty. I’m so glad Yvonne is like minded and has started this conversation! Oh man we were typing at the same time! Glad I reread the blog post after it reloaded. Okay, so in response to your thoughts on Flow Quilting–I think with experience and practice you would probably be in the same or similar zone as me when quilting in this style. But the idea is that one quilting motif flows into another, right? Even if you’ve planned it out in advance or are making it up as you go the idea still works. Also I forgot to comment on your awesome little mini! It’s so fun and cute, great mix of motifs! Makes me want to make more miniminis…but noooo I cannot be distracted right now! This is such an excellent topic and I’m thrilled you brought it up. As FMQ advances as an art form, new words will need to be created. Why shouldn’t various forms of quilting have new names, too. One day there may be a quilt show category for this type of of FMQ. Your word choice, Dendriform, is unique but most people won’t relate to it. For an official term I like Composite FMQ, but personally, I prefer Zentangle or graffiti as the common reference. If I were to describe this to a non-quilter I would use the word Zentangle because she would likely know what I’m describing. All that aside, I’m eager to find out what new word will get assigned…much like the new word that replaces seamstress….sewist! Good Morning Yvonne! This is a brilliant idea that you and everyone, through discussions, have come up with. Being pretty simple minded, I choose Storyboard Quilting. It just sounds so fun and carefree. Which is no where close to where I am in FMQ but would love to reach that level. Also, pondering over the other suggestions and reading the other comments…this is a great discussion with everyone adding thoughts and details. Very fascinating and intriguing discussion on a great topic. Thank you for sharing and have a wonderful creative day! Oh Goodness Gracious…..Yvonne, it is all your fault! You had my brain thinking about the discussion on names for the type of free motion quilting with pictographs and I forgot to say a word one about your mini. LOL at myself. Alrighty then, I congratulate you on selling a mini! Especially to a dear friend who could just has easily asked you to make one, so hats off to her also! This mini mini is adorable! It makes me think of the coming spring weather. The sun, flowers, water flowing, leaves vining, pebbles and rocks. It really does make me smile and happy and I hope that it has the same effect for Cheryl. Thank you for sharing and again have a wonderful creative day! Oh this is wonderful! Did you do this on your long arm or DSM? I’ve been drawing patterns like this preparing for some practice quilting on mini sandwiches. Thank you for starting this conversation! I quilt like this too sometimes and I prefer organic or flow. Good topic! I also like organic or flow. I understand and appreciate the need to describe the intent behind the design, and I guess that’s the issue I have with organic (though it’s one of my favorites). I feel like, when something happens organically, it happens naturally — without a plan. So I guess I’m thinking something like “Conscious Doodle Quilting” for you guys. . . or something like that! Love the mini! Beautiful work! How about freeform qulting or perhaps variform qulting? Thanks for introducing the subject. It’s fun to read everyone’s thoughts on this Yvonne and see how differently people feel about words. I’m with Brenda on liking things simple and sweet. When I see people’s work like this, it does seem to tell a story. Especially when done in a large masterpiece like when Renee did the huge banner for the Albuquerque guild. So the thought of storybook quilting appeals to me. But then again, this is more artistic and expressive in a very free way, so Storybook might be too confining. That is a sweet little quilt you made for Cheryl and your quilting looks great! I really need to give quilting like this a try. What an awesome mini mini. Great quilting. No matter what it’s called, I think it’s beautiful quilting. Someday maybe I’ll get there. I still like doodling! Maybe not dendriform – it will send too many people hunting for a dictionary. Sorry! This is a very thought-provoking question, and one I’ve pondered myself when describing the quilting on my Tutti Frutti quilt (http://quiltingmod.blogspot.com/2015/02/tutti-frutti-finish.html). Similar to Karlee or Martha Huggins of Zentangle, I used multiple designs to fill a space. However, attributing Karlee or Martha for every instance of this type of quilting due to their publications or notoriety is superfluous, when the actual quilting was not directly influenced by the instruction or methodology of either. Doing so also turns “Zentangle” and “graffiti quilting” into generic trademarks. This wrongful attribution is unlikely to do either party any favors. I think the term composite (not composition due to the same reasons why I’d like to avoid Karlee and Martha’s terms) is the most accurate, though “freestyle free-motion” has a nice ring to it. I vote for freestyle freemotion too! Very clever idea and it fits the bill completely! So many great suggestions. I don’t have any new ones but I agree with those that like flow and concept as names. My favorite is emergent. Well, I also liked Agile which was suggested in a comment. Good discussion Yvonne. It is clearly a ‘style’ of FMQ. One that I have yet to try. Great discussion. I’m scratching my head trying to think if there is anything different to call it. My question though is if you assign a name to it, will it then be considered Yvonne’s name and the same discussion will then be used by the next quilter trying to make it uniquely theirs? When does a name become “acceptable” to use by all quilters? Beautiful mini mini! I’m sure Cheryl was over the moon 🙂 I like the term organic flow quilting, but really it makes me think of zen quilting or rather zen tangles. A very interesting discussion, Yvonne! I used the term ‘graffiti quilting’ in my blog post, but I’m very aware that my style is *nothing* like Karlee Porter’s (which is much more angular). I quite like flow quilting or freestyle quilting. Organic is often used to refer to lines that are almost, but not quite, straight, like organic matchstick quilting, so I don’t think it works to describe this style. Oh, and the mini mini is really cute! Woohoo, I love my mini mini, it is going on my wall right next to my sewing machine so that I can be inspired by it each time I sew, thanks again! 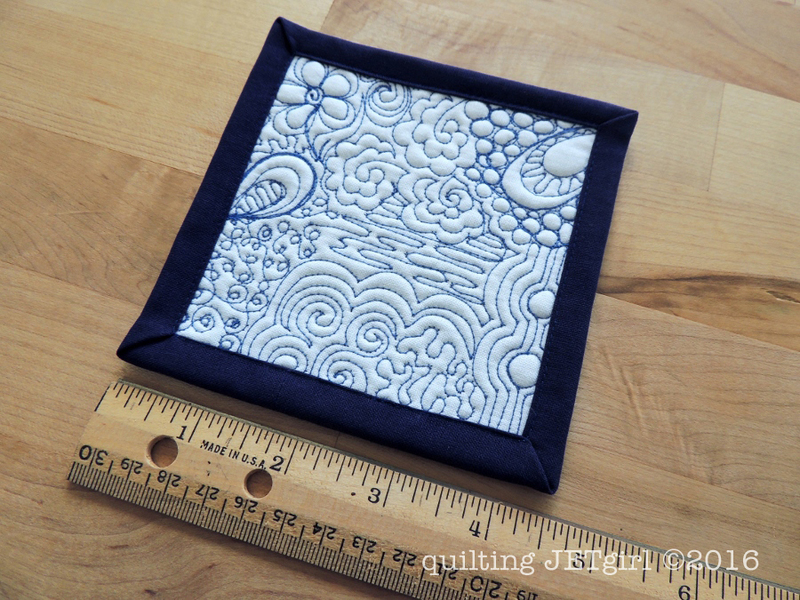 I really like “flow quilting” and that’s the feeling I get from looking at your mini mini – it looks like you flowed from one design to the next. What a thoughtful gift (in more ways than one 😉 ) and it’s quite awesome! I like to use Organic when it is very simple, I like the word composition when you are planning out elements when you change it up. Love graffiti when things just blossom from the start and it just explodes out of your mind. Flow does work in my mind but that is more a skill level. When something flows and you are in the zone means to me you know what you are doing and it just evolves. That is now where i am at! ha I really love meticulous cutting as I never liked fussy cutting. Great convo? This is going to niggle in my mind now! It feels like there should be the perfect word out there, it almost feels like it’s on the tip of my tongue but it isn’t! I’m not sure any of the words so far feel quite right to me but that’s not the most positive thing to say! Your mini mini has an amazing amount of quilting detail for it’s size, I’m sure people must look at your photos of these and not fully appreciate the scale. I actually wrote about this awhile ago and really wish we had a good term, as well! It seems silly that each quilter has to rename it when we are using the same, overarching method. I call it “blended quilting” (because you are blending different types of quilting). Looking forward to when a name for it sticks!